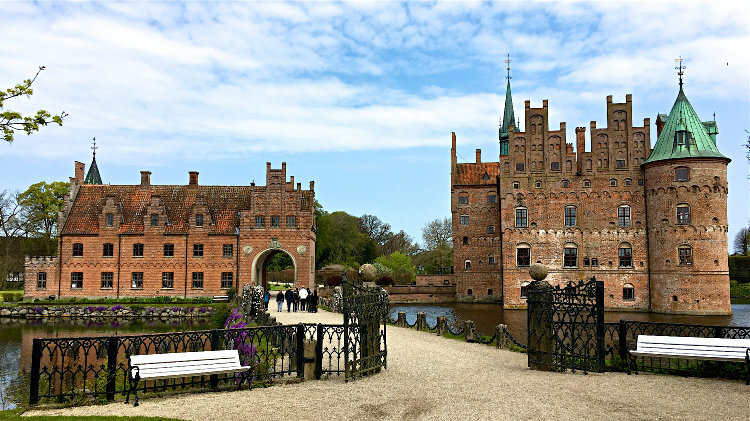 Romantic Egeskov Slot is a living castle with fun park for families, museums, and beautiful gardens located on the island Funen near Odense in Denmark. Renaissance Egeskov Slot is an impossibly romantic moated castle with one of the most beautiful gardens in Denmark. It is a truly family-friendly destination with a very large fun park, a variety of play areas, a treetop walk, maze and old-fashioned games. The still inhabited castle is open to visitors, as are a variety of easy to enjoy exhibitions and museums. Picnicking is actively encouraged. 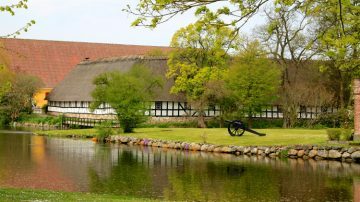 Egeskov Castle is on the island Funen (Fyn) near Odense and one of the top destinations to visit in Denmark. 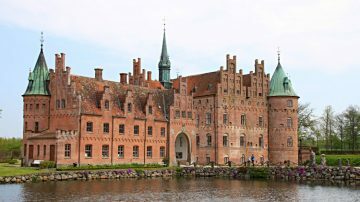 The Egeskov Castle is a beautiful Danish Renaissance castle surrounded by a wet moat. It is at the heart of a 20 ha park that is part of a much bigger 1150 ha commercial farm. Egeskov Castle – seeing the interior of the magnificent still inhabited moated Renaissance Castle. The Castle Park – a variety of formal gardens. The Exhibitions – an eclectic collection of museums covering anything from antique cars to fashion. 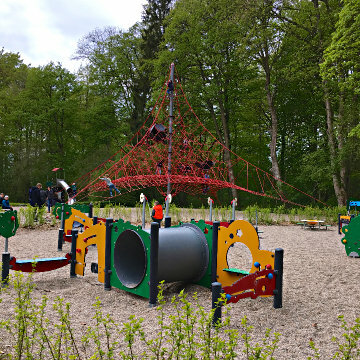 The Play Forrest – a fun play park with maze and tree top walking course. Impossibly romantic Renaissance Egeskov Slot was completed in 1554 but somewhat altered in the 19th century. The castle is surrounded by a wet moat and built on oak piles. The castle is still inhabited by the count of Ahlenfeldt-Laurvig-Bille but much of it is open to visitors. Egeskov is Danish for “oak wood” as it is claimed an entire oak forest was felled for its construction. Such Renaissance buildings destroyed the forests of Fyn, which resulted in a loss in topsoil that took centuries to recover. In this the Renaissance nobles were in good company – it is claimed that half the oak forests on Zealand was felled to build the Viking ring fortress at Trelleborg. Admission to the castle is via the Gate House rather than the off-limits draw bridge. It was only added in 1880 but looks the part. It currently has an exhibition of mostly 19th century fashion although the price item is part of an older costume that belonged to ill-fated French queen Marie Antoinette. The interior of the castle has a lovely live-in feeling that often is missing in many other palaces open to visitors. 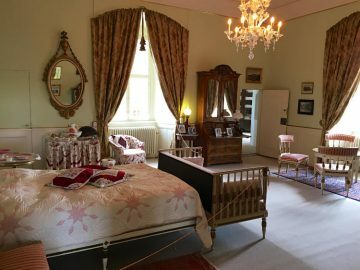 Around 15 of the 66 rooms are seen including the typical range of hunting room, formal reception rooms and a few bedrooms. The castle is seen without a guided tour. Casually blended in with the other furniture and trinkets are some real treasures and interesting curiosities too. The impala horns are a record 90 cm, some of the small San arrows are still poisonous and Denmark’s oldest longbow is on display. Some of the porcelain is Meissen, some of the chairs Chippendale. A highlight is the world’s largest dollhouse – Titania’s Palace. It was completed in 1907 after 15 years of work and has around 3,000 items. It is on loan from the LEGO Fund but fits beautifully in this castle. Nearby are some Hans Christian Anderson paper cutouts – Egeskov Castle is one of few country manor houses in Denmark where he never slept. HCA, as he is often referred to in Denmark, tried to visit twice but the count was out. Don’t miss the loft Despite the up-and-downs and some low ceilings. The displays here include antique toys and old kitchen equipment, as well as a large collection of pottery and porcelain. 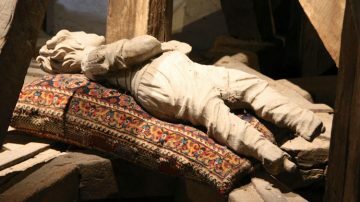 Most famous in the loft is the wooden man – according to legend the castle would slip into the moat on Christmas Eve if he should ever be moved. He is duly fed every Advent when the Christmas decorations are put up. The Egeskov Slotspark (Castle Park) is amongst the most beautiful in Denmark and may be divided into around 20 separate gardens. 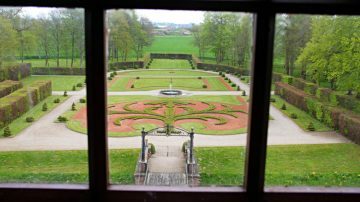 This includes formal gardens on Renaissance and Baroque patterns but also more modern interpretations of structured gardens. Close to the moat are the formal kitchen and dahlia (140 varieties) garden, with tulips (80 varieties) in spring, while a formal Renaissance garden faces Egeskov Castle’s original drawbridge entrance. The park is famous for its fuchsias – around 1,375 varieties are planted. Some of the 12 km of hedges are 270 years old and reach a height of 8 meters. 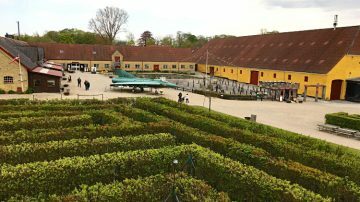 The old maze from 1730 still survives – partly due to it no longer being open to the public. The modern Garden of Life with Caroline’s Garden is well worth visiting. 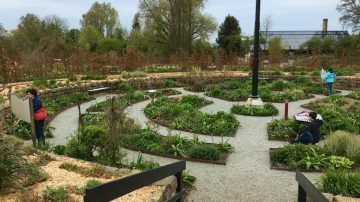 In addition to the plants, visitors may play here with large open-air musical instruments. Egeskov Castle has a variety or exhibitions and museums as part of the visitors’ attractions. Many collections seem to be based on whatever a particular count fancied. The displays are easy to enjoy, even on a quick stroll through although some items are very well described too for visitors with a keener interest. 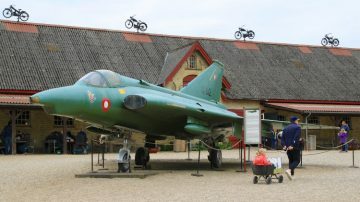 The classic cars, airplanes and motorbike collections are particularly extensive. Don’t miss the repository in the loft. Here the motto is pile them high and dust seldom. 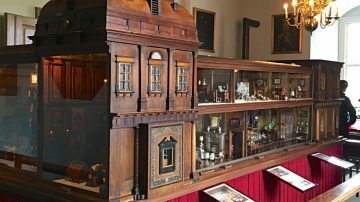 Other displays include man and mechanics at the end of the 19th century, the development of the bicycle, historic shops and grocers. 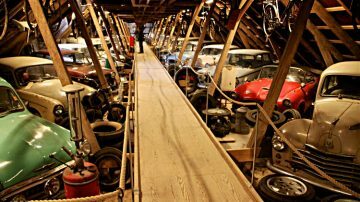 A separate museum houses the collection of historic and fairly modern rescue vehicles used by Falck – a Danish automobile and rescue service. Even a quick walk through the exhibitions is fun. A longer stay with close-up look is very rewarding. 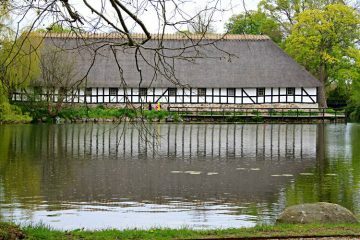 The Legeskov (play forest) at Egeskov Slot is famous in Denmark. Here the young, and not so young, may enjoy a large variety of games and activities. 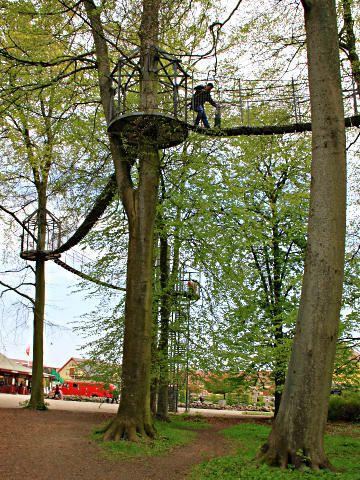 A highlight is the tree top walk on a 100-m wooden, metal and rope walkway around 15 m above the ground. The walkway is safe but swaying. Great-grandfather’s playground has old-fashioned games, tug-of-war, stilts and soapbox cars. Nothing here requires electricity or electronics. A very large play area has jungle forests and play pits for smaller children. The climbing net is at 11 m the biggest in Denmark. The large oak tree here is the only one surviving from the original construction period of Egeskov Castle. Admission to the park, exhibitions and castle is usually DKK190 for adults and DKK110 for children 4 to 12. 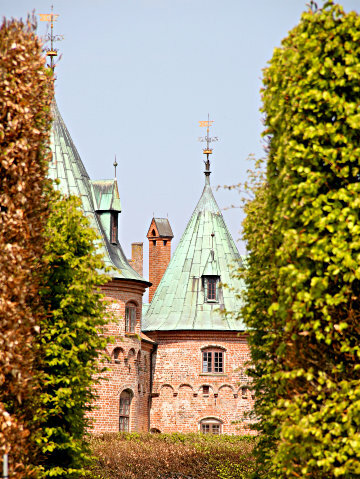 During the high summer, there is an optional DKK30 surcharge to see the interior of the castle. Admission tickets generally cover all activities except for the Segway course and horse carriage rides. A season ticket is cheaper than two admission tickets. Egeskov Castle is generally open daily from late April to late October from 10:00 to 17:00 (may close an hour or two later during summer). Special openings are arranged with Christmas Market on some weekends in November and early December. Open by Night – has events a few nights during summer. The food options at Egeskov Slot are frankly not that inspiring. The kiosks offer the standard type of junk food while the more pricey Café Jomfru Rigborg offers better fare but it is sometimes closed. A great option is to do as the Danes – take an own picnic. 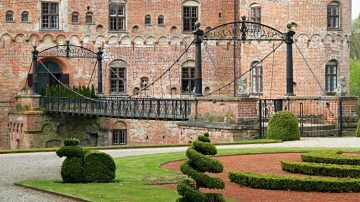 Picnicking is very popular in Denmark and actively encouraged at many sights including Egeskov Castle. Getting to Egeskov Castle, Egeskov Gade 18, 5772 Kværndrup, Denmark is easiest by car but public transportation is also available. It is also a very popular destination on cycling tours of Denmark. 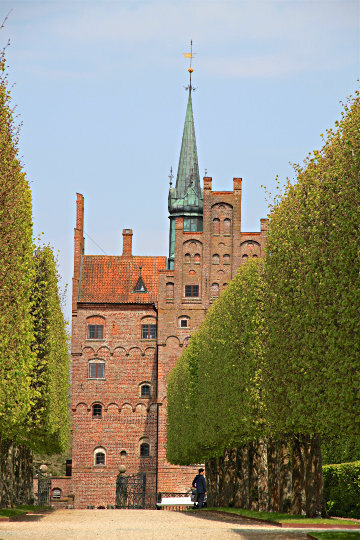 Egeskov Castle is located in between Odense and Svendborg on the island Funen (Fyn). It is around 30 minutes drive from Odense or Nyborg and 20 minutes from Svenborg. From Copenhagen, it takes around 2 hours for the 160 km drive. Plenty of free parking is available. Kværndrup Station is the closest to the castle but it is a 3 km walk. Bus 920 does the journey in 2 minutes but it is badly coordinated with train arrivals and the waiting times may be nearly an hour. No taxis are available from this station. Alternatively, use a taxi from Ringe Station – order in advance from Palle’s Taxi – that costs around DKK170 each way. From Nyborg (an hour) or Faaborg (25 minutes), use bus 920, stop Egeskov Gade (Faaborg Midtfyn). Egeskov Castle is also a very popular stop on cycling tours of Denmark. A very basic camping site is available – free but tent only and maximum two nights. Tripadvisor users generally rate Egeskov Castle very well. It is of course possible to visit Egeskov Castle on a day trip from Copenhagen but few would regret staying a bit longer on Funen. Odense with the Hans Christian Andersen Museum is the largest city on Fyn but other major cities including Svenborg, Faabord and Nyborg also have castles and beautiful old town centers. The Ladby Viking Ship Museum has the only Viking era ship grave in Denmark with the boat still in the original position. Also worth seeing if driving from / to Copenhagen is the Trelleborg Viking ring fortress on the island Zealand just across from the Storebælt toll bridge that is the highest physical point of Denmark.